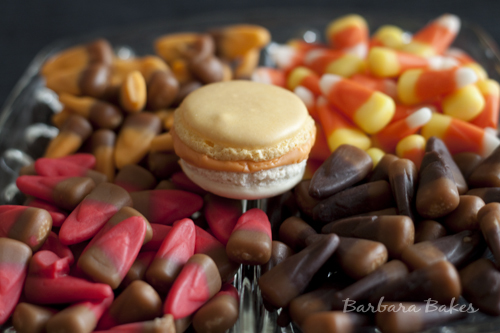 A colorful candy corn macaron with a yellow bottom, a white top, and creamy orange pumpkin spice filling. I got a little carried away at the store today. 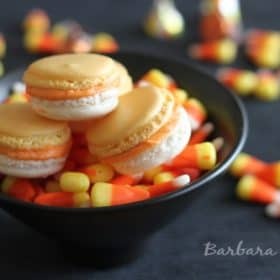 I had this idea to make candy corn macarons for this month’s MacTweets and I went to the store to buy candy corn to dress up the pictures. When I got there, they had ordinary candy corn of course, but this year Bach’s also had Caramel Candy Corn, and Chocolate Caramel Candy Corn, and Caramel Apple Candy Corn. All of which I decided I should take home and try. The reason for my apparent current obsession with candy corn is that I hate them. I think they have a horrible, waxy flavor. My husband and my kids seem to like them, but I think they’re pretty nasty. But I do sort of think of them fondly. They remind me of this time of year – cooler weather and yummy treats. Candy corn always seemed to be hanging around when you were bobbing for apples or eating pumpkin chocolate chip cookies. They look so cheery and fun and I really do want to like them. 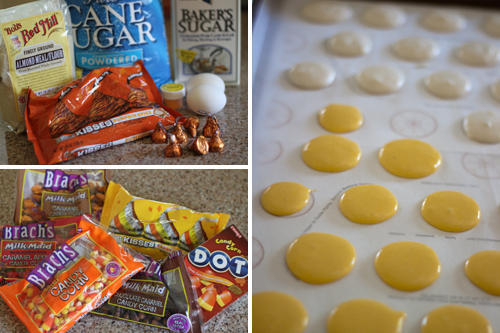 So when I saw the orange pumpkin spice Kisses I thought they would make a perfect filing for a candy corn mac. A candy corn that would be full of fabulous fall flavor, not waxy and bland with an odd smell. Of course, I wanted to make the top white and the bottom yellow. I tried shaping one in the shape of a candy corn, but it looked more like an egg, so I stuck with round candy corn macs instead. I made the Ottolenghi recipe that works well for me. I used half the batter for white and then added yellow to the other half. If I was making two colors again, I would make half a batch of each because the yellow got over mixed and spread much more than the white ones, making it hard to match them up. I made the filling by melting about 10 Pumpkin Spice Kisses in the microwave at 50% power for about 1 minutes and adding enough powdered sugar to make a thick filling. 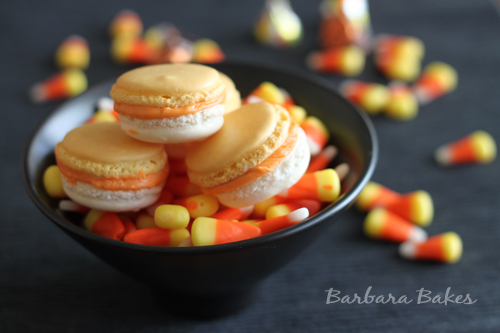 This really is a perfect mac flavor for fall and so much better than candy corn candies. Rap the baking sheet a few times firmly on the counter top to flatten the macarons. Leave out, uncovered for 15 minutes, then bake them for 15-20 minutes. Give the macs a gentle little shake with the tip of your finger to see if they’re done. You want them set but not firm. It’s better to undercook them. Let cool completely then remove from baking sheet. So you may be wondering what I thought of the other flavors of candy corn – waxy and nasty. Somehow the Kisses nailed the strange candy corn flavor in their Candy Corn Kisses, but at least it was smooth and creamy and not waxy. The Dots sort of captured the candy corn flavor but in a gummy sort of way. Be sure and stop by MacTweets on September 20th to see the roundup of long ago & far away memories of the MacTweeters.